Because there was not already an over saturation of Star Wars crap for you to buy in stores, Google has launched Star Wars themes for your apps, just in case you needed more Force in your life. If you have a Google account, and use it for Gmail, Google Maps, YouTube, and other Google services, you can experience what the Light or Dark side have to offer their users. To start, you will need to choose a side – Light or Dark. 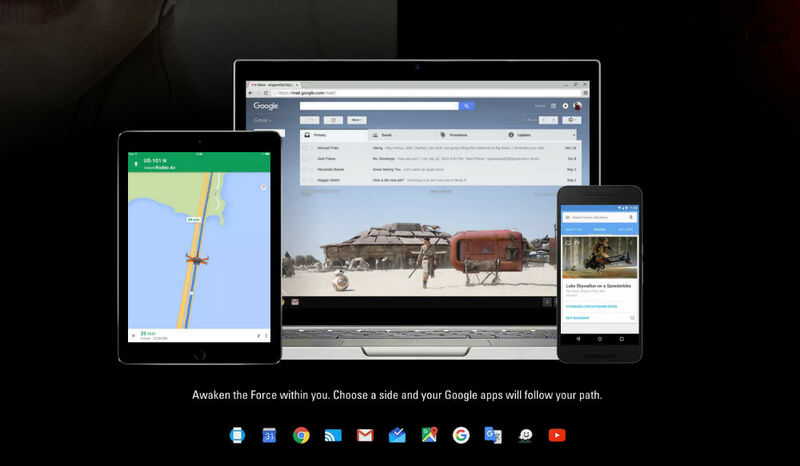 Once a side is chosen, you will begin to see Star Wars themes throughout many of Google’s applications, whether it is on an Android device or desktop computer. For example, I chose the Dark side, opened my Gmail, and I was greeted with a darkly colored Empire theme. In addition, if you open Google Maps, find your home, you should see a Death Star. As for which applications you will see changes take place, Google lists that YouTube, Chromecast, Google Maps, Waze, Gmail, Inbox, Google Translate, Android Wear, Google Search, and Google Calendar will all see a Star Wars transformation. Here are a couple of notes. Yes, you can change sides once you have already made a selection. If you don’t care for these themes, you can also easily go back to the default settings. Also, Google notes that it may take a couple of hours for all changes to take place, so once you make a side selection, allow for time to pass before you get upset about not seeing wookies and what have you. And finally, these themes are only available for regular Google account users. No Google Apps for Work, Education, or Government are supported. You can join a side by clicking the link below and signing into your Google account. Join the Light or Dark side here.